Starting with the positives, the Tarte Share Tape concealer has really, really great coverage. I'm seriously impressed. It covers dark circles, blemishes, redness, everything. A lot of concealers I try which are meant to be full coverage often don't meet my expectations, but this one really does. The downside is that I do find it drying on some areas of my face, particularly under the eyes. That's quite a disappointment for me as the under eye area is what I thought this would be best for. I've found that being more sparing with my application helps with this, but it's still not really the best formula for drier skins. The other disappointing factor for me with Shape Tape, after being swept up in all of the hype, is that it creases. A lot of people claim this concealer doesn't crease, and although I've never found a concealer that doesn't crease on me, I held out hope that this wouldn't. The first couple of times I tried it creased horribly - I've found that using less and powdering it immediately with a very small amount of a super fine powder helps, but the same would be true of most concealers. I'll carry on using Shape Tape, and I do like the level of coverage it offers, but as it's drying on me and creases a lot, it's not a product I'll be rushing to re-purchase. One more important point in my opinion - this can only be applied with a beauty blender / blending sponge - I tried a brush one day just to see what happened and the finish was very cakey and un-even - the concealer dries fast on the skin, so a damp sponge is definitely the way to go. 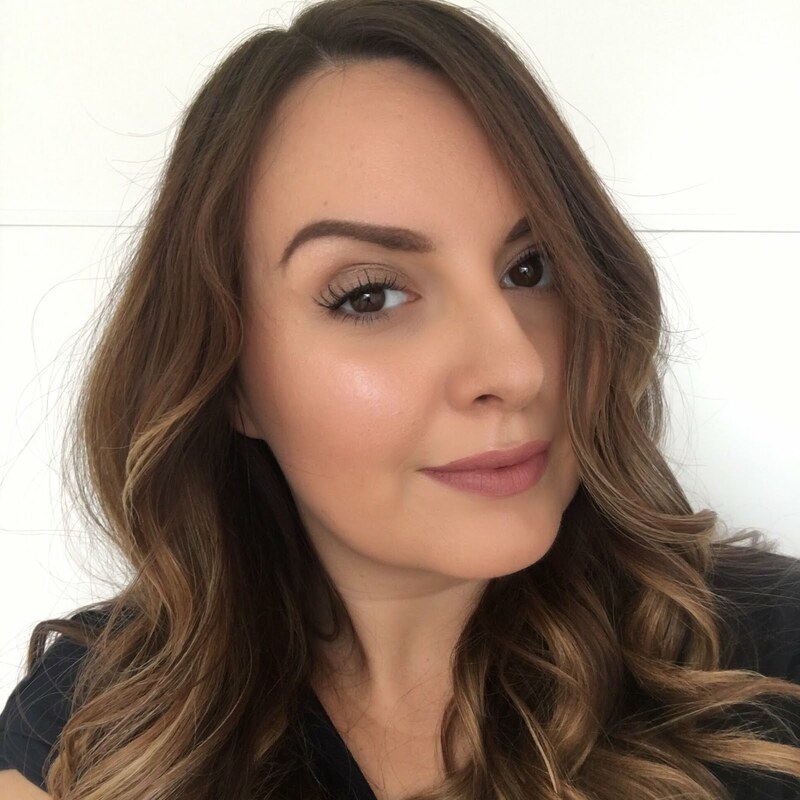 Although I've found I'm not Shape Tape's biggest fan, a lot of people do love it and will be keen to know if Makeup Revolution's £4 offering measures up. Firstly the packaging and the wand are very similar, so the concealer applies in very much the same way. Makeup Revolution has a wider shade range, so it may be easier to find a good match for your skin and it wins on that front. I went for shades C3 and C5 to try something paler for under the eye and a bit deeper for the rest of the face. I got Tarte Shape Tape in Light Medium and I'd say this may have been similar to the shade C4 which I didn't pick up, as it's somewhere between the two colours. When it comes to coverage the Makeup Revolution shape tape dupe is no match in my opinion - you can even see in my swatches that the coverage is not as full. I'd say that Shape Tape is a proper full coverage concealer whereas Makeup Revolution's version is more of a medium. 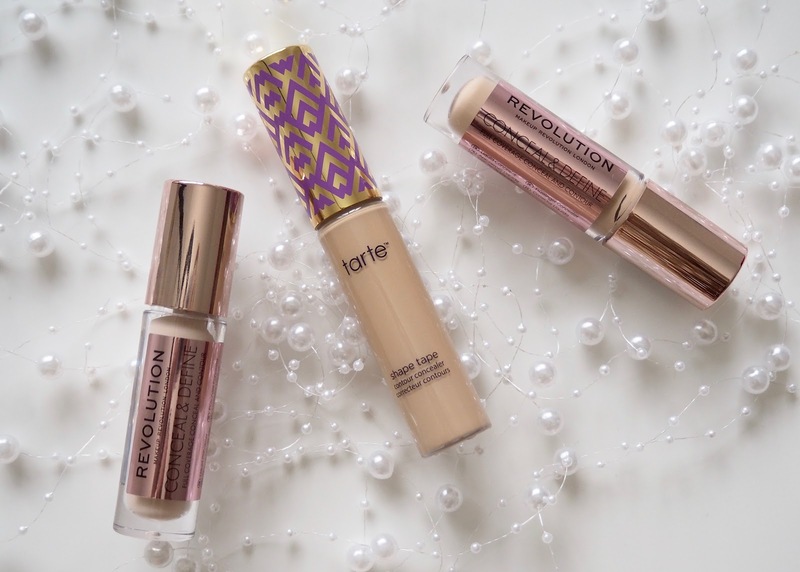 Both concealers crease under my eye to about the same degree, so no winner there, but the Makeup Revolution offering can be applied more generously without looking too heavy or dry. I'm tempted to pick up one of the darker shades and see how it fares for contour. 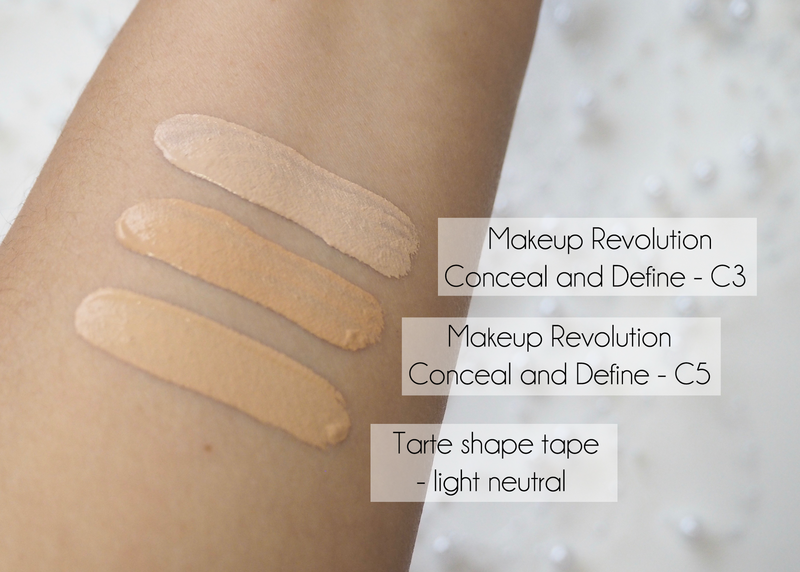 I think the Makeup Revolution Conceal and Define concealers are not bad at all for the price at £4, but the formula doesn't share much of a similarity with Shape Tape. 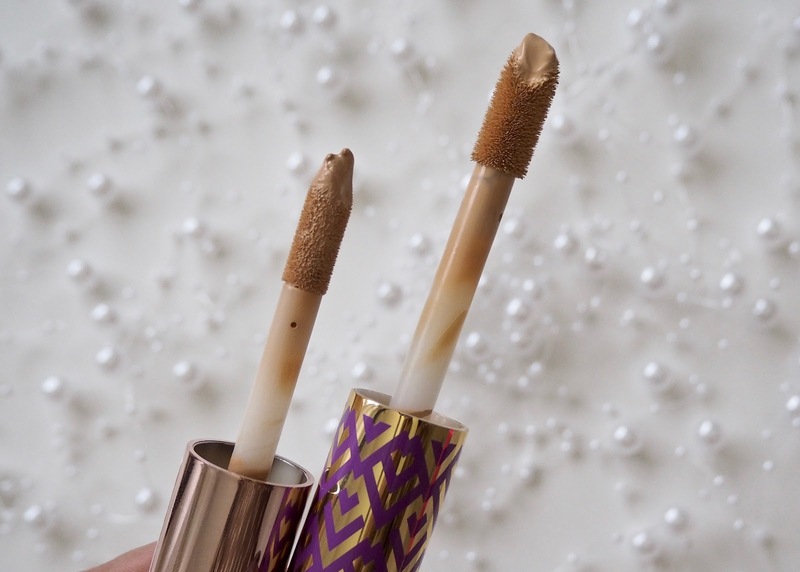 Tarte's Shape Tape is one of the most full coverage concealers I've tried, although if you have dry under eyes like mine, it can be unflattering and prone to a lot of creasing. My quest for the perfect under eye concealer continues....! Shape Tape is available at Tarte.com priced at £22 (although customs charges are added at check-out) or at QVC where it costs £28 and comes with a blending sponge. 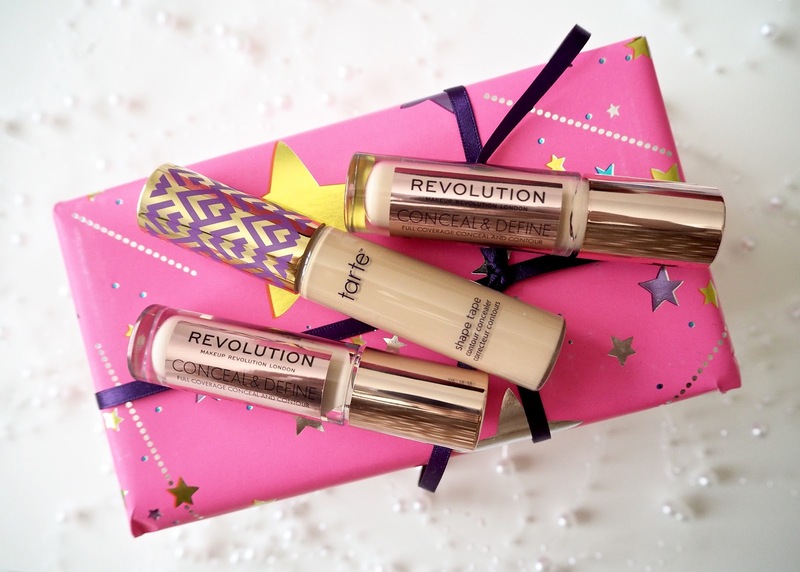 Conceal and Define full coverage concealer and contour is available at Makeup Revolution and Superdrug and it's £4.